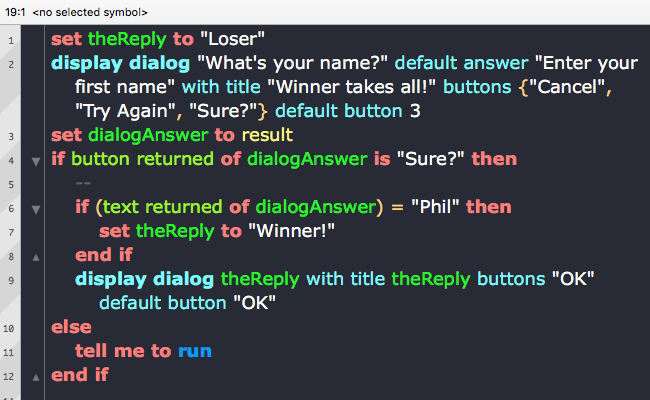 Posted on September 1, 2018, in AppleScript and tagged applescript, automation, integration, interapplication communication, learn, Script Debugger. Bookmark the permalink. 1 Comment. Totally agree. Learning Applescript was a very steep, very frustrating curve. But the payoff has been enormous are far as timesaving is concerned. Especially with the tedious stuff I call monkey work. Most of my scripting has been with Adobe InDesign, the Finder and harnessing the power of the shell for things like image resizing. I seriously could not imagine doing my job without Applescript now that I have tasted the awesome sauce.